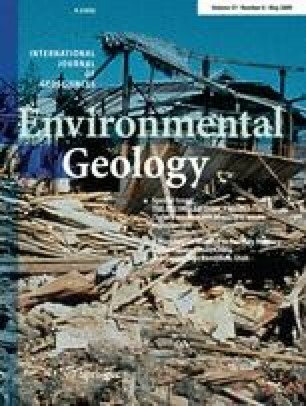 This paper describes current knowledge about the nature of and potential for thermo–hydro–mechanical–chemical modelling of the excavation damaged zone (EDZ) around the excavations for an underground radioactive waste repository. In the first part of the paper, the disturbances associated with excavation are explained, together with reviews of Workshops that have been held on the subject. In the second part of the paper, the results of a DECOVALEX [DEmonstration of COupled models and their VALidation against EXperiment: research funded by an international consortium of radioactive waste regulators and implementers (http://www.decovalex.com)] research programme on modelling the EDZ are presented. Four research teams used four different models to simulate the complete stress–strain curve for Avro granite from the Swedish Äspö Hard Rock Laboratory. Subsequent research extended the work to computer simulation of the evolution of the repository using a ‘wall-block model’ and a ‘near-field model’. This included assessing the evolution of stress, failure and permeability and time-dependent effects during repository evolution. As discussed, all the computer models are well suited to sensitivity studies for evaluating the influence of their respective supporting parameters on the complete stress–strain curve for rock and for modelling the EDZ. This document has been written within the context of the DECOVALEX-THMC 2004–2007 project (DEmonstration of COupled models and their VALidation against EXperiment). The authors are grateful to the Funding Organisations for their support and to Rolf Christiansson of SKB for his help and facilitation of the experimental work, both in the surface laboratory and in the underground Äspö Hard Rock Laboratory. The reviews of two anonymous referees helped the authors to improve the paper.